Records of burials were provided by the U.S. Department of the Interior on October 29, 2000. Total records = 5,254. 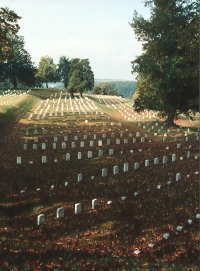 Vicksburg National Cemetery was established by an act of Congress in 1866. It has the distinction of having the largest number of Civil War interments of any national cemetery in the United States. Of the approximate 17,000 Union veterans, only 5,000 are known. There are no Confederate burials here. Confederate soldiers were interred at Cedar Hill Cemetery in the City of Vicksburg. After the establishment of the Cemetery, extensive efforts were made to locate the remains of the Union Soldiers throughout the Southeast and move them to Vicksburg for reinterment. At the time this occurred many of the markers had faded or were lost to the elements making identification impossible. The national cemetery also has veterans from the Mexican and Spanish-American Wars, World War I and II, and the Korean Conflict. The cemetery is closed and no longer accepts burials. The last burial occured in 1963.